BURN, WILLIAM SCOTT, merchant, accountant, justice of the peace, militia officer, teacher, and author; b. 8 March 1797 in the parish of Inveresk, Scotland, son of David Burn, timber merchant, and Helen Scott; m. with at least one son and two daughters; d. 30 Sept. 1851 in Toronto. 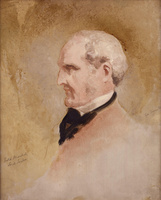 William Scott Burn studied arts at the University of Edinburgh in 1811–13, after which he may have acquired training in accountancy in Edinburgh, a leading centre for that profession. By 1825, however, he had established himself as a timber merchant in nearby Leith. In 1833 he immigrated to Upper Canada, bearing a letter from John George Shaw-Lefevre, the parliamentary under-secretary in the Colonial Office, to Lieutenant Governor Sir John Colborne* which introduced him as a “gentleman of experience in mercantile and agricultural pursuits.” The following year he settled in Barton Township near Hamilton and reputedly became involved in the grain trade, in addition to other business enterprises. He was made a director of the Gore Bank in 1836 and about a year later he became a trustee for a proposed road from Hamilton to Brantford. In 1838 he was commissioned as a justice of the peace and was appointed a militia paymaster. Though baptized in the Presbyterian church, he acted as secretary for the Anglican congregation in Barton. By late 1839, for reasons which are not clear, Burn was in serious financial difficulty. During the early 1840s his work as an accountant and his other ventures were not lucrative. He was forced to put up for sale, through assignees (David Burn in 1842 and later Judah George Joseph of Toronto), his house and farm, called Chedoke. Some time in the following year he moved to Toronto. A handful of accountants worked in the city but there was not enough professional business to engage any of them full time so most practices combined accounting with bankruptcy and general financial agency work. Burn’s practice developed slowly, if at all, for in the spring of 1844 he declared bankruptcy. In 1844–45 he temporarily replaced James Duffy, an English master at Upper Canada College. It was evidently for the college’s course in bookkeeping, which Burn presumably taught, that he prepared The principles of book-keeping, one of the earliest textbooks on accounting written in Canada [see Joseph Laurin*]. This work, which remained in use at the college until after 1856, provided a straightforward introduction to basic bookkeeping, with a heavy emphasis on procedural aspects. Designed for use in the classroom, it contained sample transactions with space in which the student could work. Burn’s principles were in no way revolutionary although he did propose a simplification of ledger-balancing routines. In 1845 his introductory text was followed by The principles of book-keeping, by double entry; exemplified in their application to real business. This text came in two parts, with some notes on teaching methods, a subject which interested Burn. The first part was a standard practice set, dealing with retail business, for students who had progressed beyond the primary level. It was in the second part that Burn introduced innovations. He argued that by making changes to the structure of the cash-book, notably the insertion of additional columns, it was possible to take all the transactions of a business and account for them in the cash-book by the double-entry system of recording. But for all his innovations Burn was more important as a popularizer than as a theorist. In 1846 the Cobourg Star praised Principles as “the best and most lucid work on the subject with which we are acquainted. Mr. Burn is evidently not only an experienced practical merchant, but a man of no ordinary philosophical depth and literary accomplishment, whilst he possesses the happy talent of rendering his subject matter interesting and level to the most ordinary capacity. When one reflects on the loss of money and loss of time which occurs to men in business from ignorance of a clear and correct system of book-keeping, a little volume such as Mr. Burn’s, becomes invaluable.” Most business transactions, both commercial and personal, were based on credit. Sloppy bookkeeping was therefore not just inconvenient but also potentially disastrous. Burn’s reputation as an accountant rests on the work he did in the building society movement in Toronto [see Joseph Davis Ridout*]. Developed in England in the early 19th century, the building society was a financial intermediary for the secure investment, in real property or mortgages, of the relatively small monthly contributions of its members. The society was also a source of loan capital. When enough contributions had been accumulated, members could borrow from the society upon first mortgage security, to finance construction projects or acquire real estate. Such loans were limited to the amount of the shares the members had subscribed. When contributions and earned profits were sufficient to pay up the shares, usually in eight to ten years, the society would terminate. The investing members would receive their contributions plus accumulated profits while borrowing members had their debts discharged. Because of its various interests and the large number of transactions involved, the accounting for building societies was complex. The terminating building society movement was particularly strong in Upper Canada. At least 30 societies existed, 7 of them in Toronto, and probably 1 in 12 urban adult males was a shareholder. Burn became a consultant to the Church of England and Metropolitan Building Society, one of the societies incorporated in Upper Canada after enabling legislation had been passed in 1846. By 1848 Burn was also acting as an auditor for the Toronto Building Society; in March 1850 a group which included Joseph Curran Morrison* and Judah George Joseph formed the County of York Building Society and named Burn as secretary-treasurer, a position he held until his death. In announcing his appointment, the British Colonist credited him with designing the accounting system in general use by such societies. The building society positions probably gave Burn a steady income with which to cover the overhead expenses of his accounting business. Among his professional clients, in 1850, was the Toronto, Simcoe, and Lake Huron Union Rail-Road Company, for which he and other leading Toronto accountants reported on the financial forecast contained in the company’s prospectus. During most of the years he worked in Toronto, his wife and daughters ran a Berlin-wool and fancy-work establishment. This operation was an artistic success, for Mrs Burn took a prize in Berlin work at the mechanics’ institute show of 1851, but whether her shop achieved equal success commercially is not known. William Scott Burn died in Toronto of stomach cancer on 30 Sept. 1851 and was buried in St James’ Cemetery. William Scott Burn is the author of The principles of book-keeping; explained in an address to a student of Upper Canada College; and an elementary course of book-keeping by double entry (Toronto, 1844); The principles of book-keeping, by double entry; exemplified in their application to real business: in two sets, consequent to the elementary set already published . . . (Toronto, 1845); and The connection between literature and commerce; in two essays, read before the Literary and Historical Society of Toronto (Toronto, 1845). CTA, RG 5, F, St George’s Ward, 1844, no.169; 1846, no.195 (mfm. at AO). Edinburgh Univ. Library, Special Coll. Dept., Matriculation records, 1811–13. GRO (Edinburgh), Inveresk, reg. of births and baptisms, 8, 20 March 1797. HPL, Clipping file, Hamilton biog., Land family: 990; Scrapbooks, Historic houses in Hamilton, 1: 55. PAC, RG 1, L3, 473: S21/46; RG 5, A1: 71741–42, 97813–14, 98654–57, 104081, 106217, 108022–24, 110347, 110917–20, 113177, 114300–2, 115915–16, 119152, 119526–27, 122798–800, 123275–79, 125378–80, 128514–18, 128519–28, 129528–31, 136872; RG 31, A1, 1842, Barton Township (mfm. at AO); RG 68, General index, 1651–1841: 571. St James’ Cemetery and Crematorium (Toronto), Record of burials, 30 Sept. 1851. Wentworth Land Registry Office (Hamilton, Ont. ), Abstract index to deeds, Barton Township, concession 4, lot 19 (mfm. at AO, GS 1408). Canada Gazette, 13 April 1844: 1222. The roll of the pupils of Upper Canada College, Toronto, January, 1830, to June, 1916, ed. A. H. Young (Kingston, Ont., 1917), 46, 50, 146. Toronto Building Soc., Annual statement of the funds and effects of the Toronto Building Society ([Toronto]), 1850/51–1853/54; The Toronto Building Society; incorporated in accordance with an act of the provincial legislature, in 1846 . . . (Toronto, 1846). British Colonist (Toronto), 19 June 1846; 21 Dec. 1849; 19 March, 4 June 1850; 14 Oct. 1851. Church, 23 Sept. 1842. Cobourg Star, 17 June 1846. Globe, 7 Oct. 1851. Herald (Toronto), 20 March 1848. Toronto Patriot, 7 May 1844. A compilation of the laws and amendments thereto relating to building societies, loan companies, joint stock companies, and interest on mortgages, and other acts pertaining to monetary institutions . . . , comp. N. S. Garland (Ottawa, 1882). DHB. Edinburgh and Leith directory, 1825–26. W. H. Smith, Canada: past, present and future, 1: 48. Toronto directory, 1846–47: 10; 1850–51: xlvi, 19. V. Ross and Trigge, Hist. of Canadian Bank of Commerce, 1: 179. Philip Creighton, “BURN, WILLIAM SCOTT,” in Dictionary of Canadian Biography, vol. 8, University of Toronto/Université Laval, 2003–, accessed April 20, 2019, http://www.biographi.ca/en/bio/burn_william_scott_8E.html.